1944, Latvia. Only RSI 10 °Reggimento Arditi have sahariana on Russian front between autumn 1943 and winter 1944. On April 4th 1944, the unit has no more sahariana because of failure, inability to recover them and weather conditions....( source: "...come il diamante! I carristi italiani 1943-´45" de Sergio Corbatti et Marco Nava). The survivors of the unit were incorporated to 2.Fallschirmjäger-Division and were sent on Normandy front. 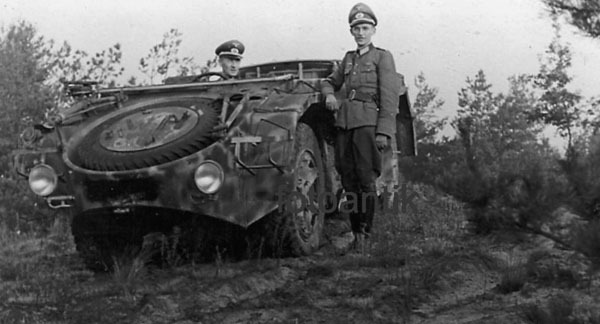 Maybe this exemplar survived and was directly taken over by other german units during transit in Latvia from Russia to Europe. Note “WH”on spare wheel and original Italian plate has been covered.